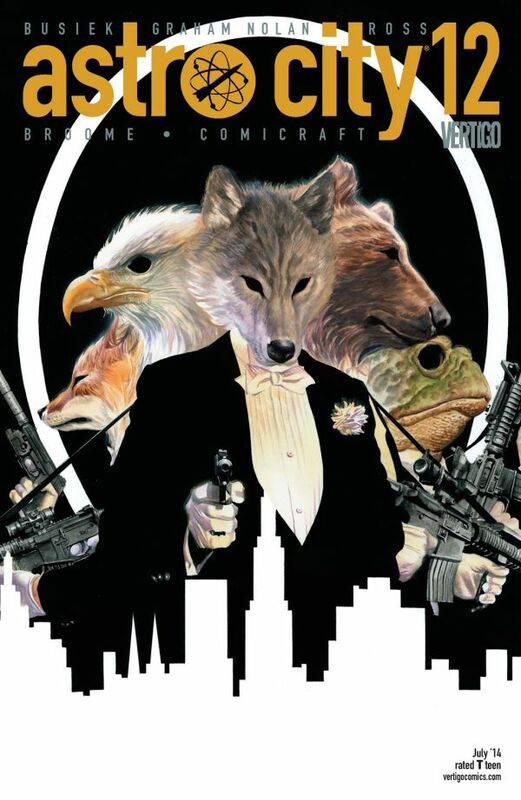 We bag on Alex Ross a lot, but this cover plays 100% to his strengths; the photorealism as applied to the masks and the guns, combined with the hollow and lifeless eyes, makes everything about this gang of criminals look sinister without eliding the fact that they’re men in suits dressed up as animals. They’re right on that line between goofy and creepy that serves many a supervillain well; you’re allowed to have fun, but you’re allowed to be freaked out. 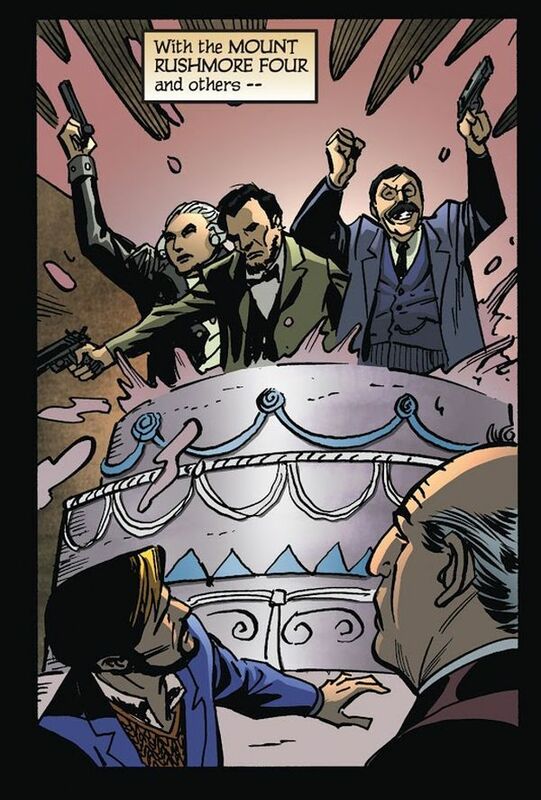 The Menagerie Gang, as featured above, is one of many, many examples of the B-list supervillain that show up in this issue, the “we need an action beat featuring four or five guys with guns that are fun to draw” kind of supervillain. 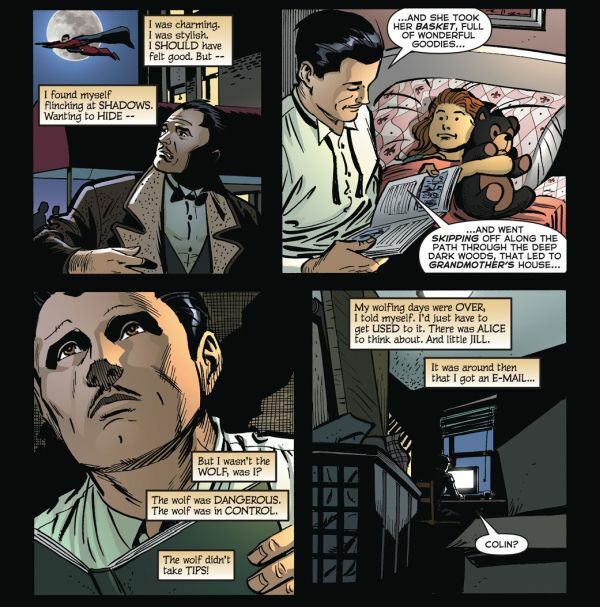 The story calls them “clotheshorses,” and centers around one of them, giving Ned his over-the-top Geoff Johns Literalist origin story: the reason he is a criminal is because, as a child, his favorite fairy tale was Guess What. You’ll notice the art style is different, because this issue is illustrated by Graham Nolan, with straighter, simpler lines and a more traditionally heroic-cartoonish style. It suits the story well, making it a nice palette cleanser in the series. Nothing in here immediately seems to relate to the Broken Man; none of it rewrites the rules of the genre out from under us. It’s simply the story of a very specific type of career supervillain, one who’s figured out the trick: all you need to do to be a supervillain is to act like one. 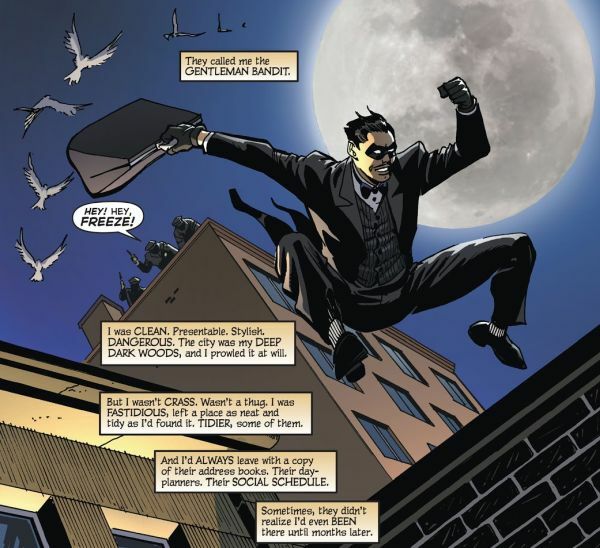 It’s the classic advice of “fake it ‘til you make it” blown up to operatic proportions, as Ned becomes more confident and self-assured as he goes out and robs people in a domino mask and a tux. He’s exactly the kind of person a street level superhero would cross paths with in a done-in-one story. 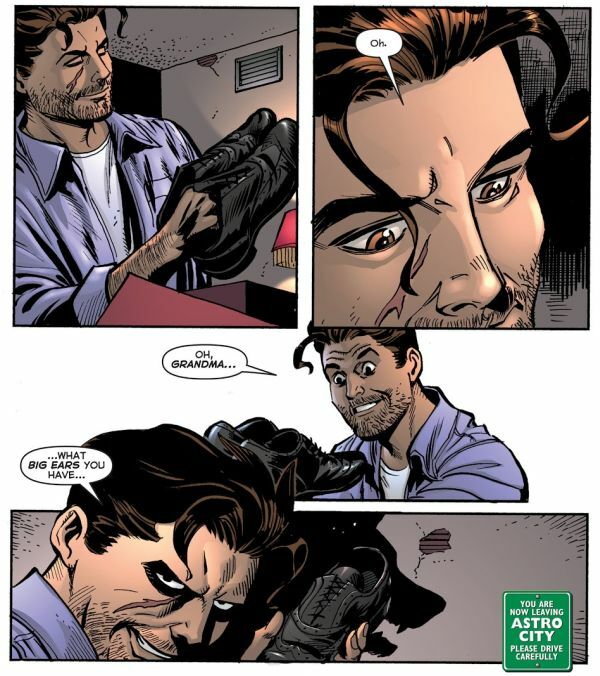 There’s no way that dress shoes are good for running on rooftops, or that a domino mask will do anything to hide your identity, but that’s the true level of superhero comics enlightenment: realizing that a supervillain with no powers is exactly as unrealistic as a supervillain with them. He gets caught, and goes to prison, nearly ruining his marriage, and comes out and tries to go straight. But if you’ve built your self-worth around doing something, disentangling it from your identity can be difficult, even when it’s no longer doing you any good. Not that comics fans know anything about that, of course. Before too long, he’s back at it. 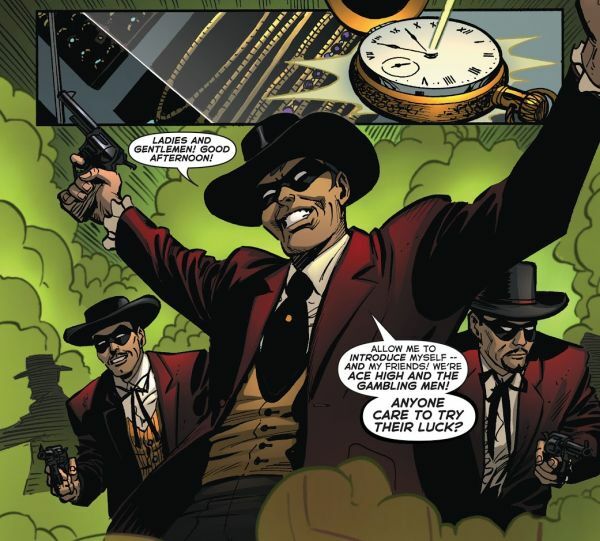 He can’t be the Gentleman Bandit anymore, but he can bring a little style to a truly amazing sequence of clotheshorse supervillain gangs – such as Aces High and the Gambling Men!! And of course, The Menagerie Gang!! I love this stuff. You could hook it to my veins and I’d live a thousand years. 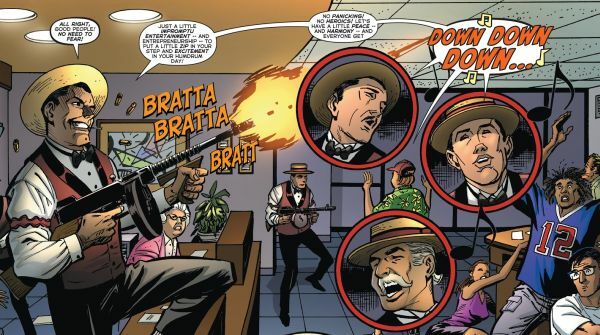 Nothing says “supervillain” like people still using Tommy guns in the 21st century as they dress up and do crimes. 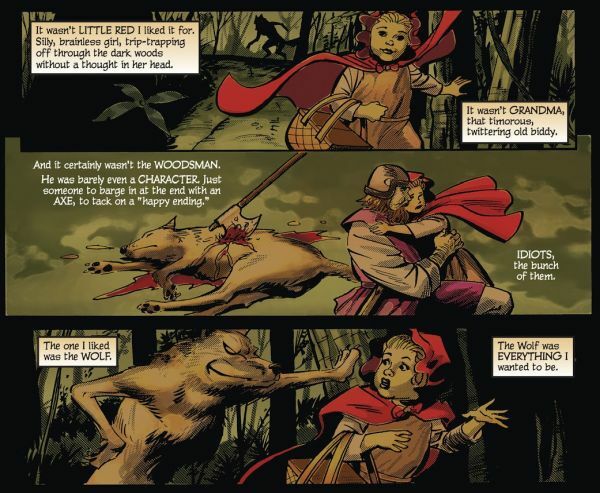 Of course, it’s all undone, because Ned has a run-in with a superheroine called the Stray – which means a man who fancies himself the Wolf gets brought down by a cat, because writers who use subtext are all cowards. 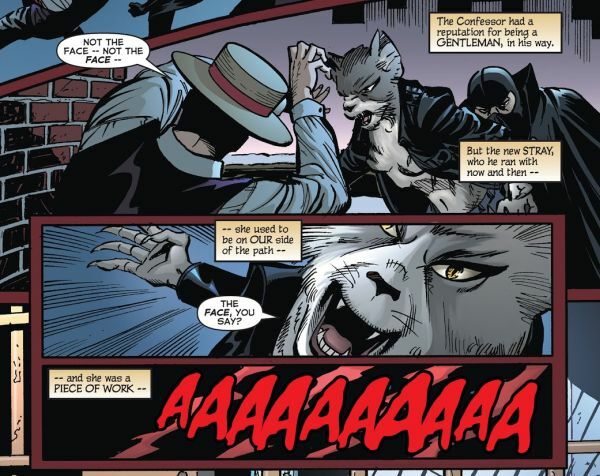 It’s implied that this new Stray is a grittier, darker Stray, therefore having a charming, unrealistic bank robber in a skimmer hat being brought down by an extremely realistic cat-human hybrid who can defeat a gun-toting man with claws that are an inch long, tops. Like I said before: it’s all unrealistic. 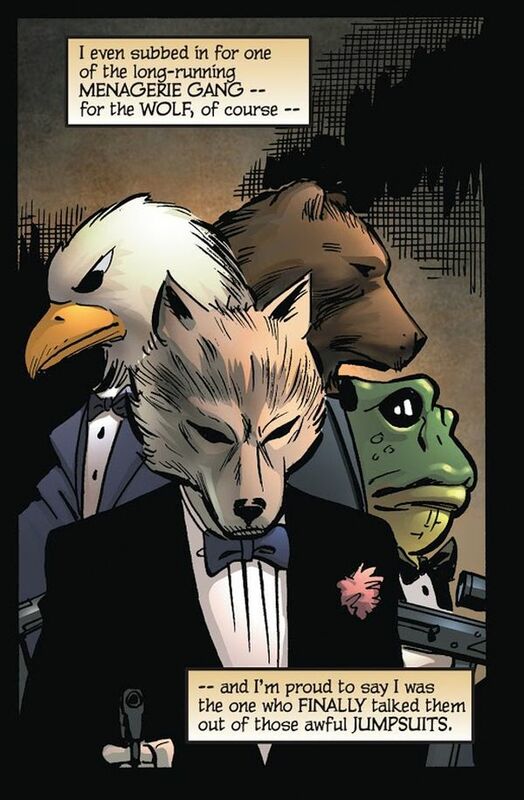 The only question is which kind of unrealism is in favor and out of favor at the moment, and sadly, too many superhero comics have no time for properly themed supervillains that just want to rob a bank. I think of the Riddler, thought by many to be the lowest of the low when it comes to Batman villains. What’s so scary about someone who tells you they’re going to commit a crime while wearing a suitjacket with question marks on it? … but, that’s how it is with Ned, and every gang he’s a part of; the game needs him as much as he needs the game. He’s not the Wolf; he’s just another piece on the board of genre convention. But within that convention, he can pretend he’s in charge, which is better than admitting he’s not; when he’s a dapper supervillain with a gimmick, he’s a part of the story even if only a brief one. Without him, it’s just muggers and carjackers that look enough like real criminals you start to wonder whether urban crimefighting is really the best solution. Who wants that? That’s it for Ned’s story, for now; next week features another bank robber, a lot of vignettes, and the music… NOT in that order? It’s a weird one. See you soon.